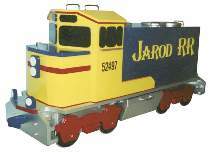 This train is a spacious toy box with a truly authentic look. Paint the name of your child’s personal railroad on the side. The numbers on the cab are your child’s birth date. A storage drawer slides out from between the wheels. There are three additional storage compartments on top. The two in front have lift-off covers. The large section in the back has a hinged lid. Make mostly from 1-1/2 sheets of 3/4" plywood. All parts drawn FULL SIZE on five very large plan sheets. Toy box measures approximately 61"L x 25"H x 16"W. Order hardware parts package separately or see Special Offer which includes both the #W2365 Plan and #3363 Hardware. Train Toy Box Hardware includes two toy box lid supports, seven chrome-plated handles, doweling, and hinges. Project plan, wood and wood finish are not included.